One-day event will take place at Bargehouse in London. Air China is opening an experience themed around bringing Londoners good fortune, timed for Chinese New Year celebrations, as part of its new "Land your dream" campaign. The airline is offering hour-long slots in "Land of luck" on 9 February. 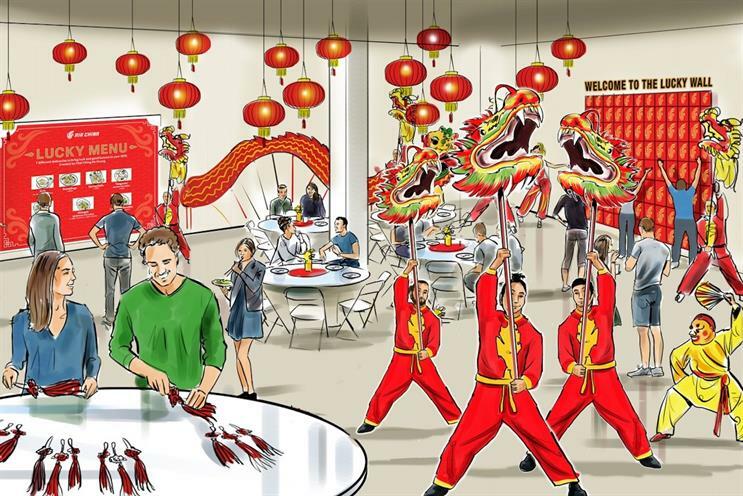 The experience, located at Bargehouse on London's South Bank, includes The Lucky Banquet Hall, offering a menu centred on good fortune; The Lucky Wall, which includes Air China gifts in red envelopes, and the chance to learn how to create traditional Chinese Lucky Knots. It will culminate with a performance of the lion dance, which is intended to chase away evil spirits. "Land of luck" was created by Burson Cohn & Wolfe and will be delivered in partnership with The Producers. Jingjie Li, general manager at Air China UK, said: "The 'Land your dream' campaign is latest step in Air China’s commitment to helping Brits land their dreams by connecting business travellers and tourists alike with all the possibilities that China and the rest of the world holds. "We are combining this passion with the traditional New Year celebrations to create the 'Land of luck' experience that will not only inspire people to achieve their dreams but also give them a lucky head start."